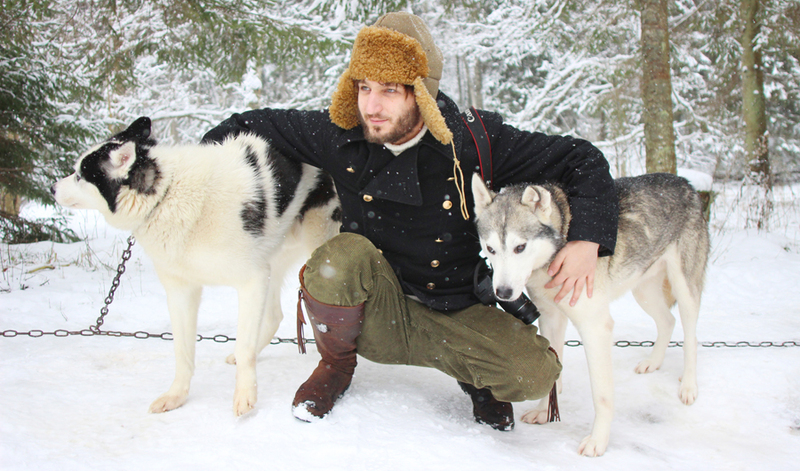 On the last leg of our Riga city break, Henry and I learnt how to be real mushers, crossing the Latvian countryside with a team of husky dogs and a sled. The wonderful staff at Gallery Park Hotel Riga made the arrangements - Henry and I were picked up from the hotel in the morning by a representative from Tour Point and we drove to the 'base camp' in West Riga for a good two hours across long icy roads (with signs pointing to Moscow!) past endless stretches of pine forest. Our guide (we'll call him R) told us fascinating stories about Latvian history, local legends, and about the high probability of the Holy Grail being lost somewhere in Riga - let's get digging! 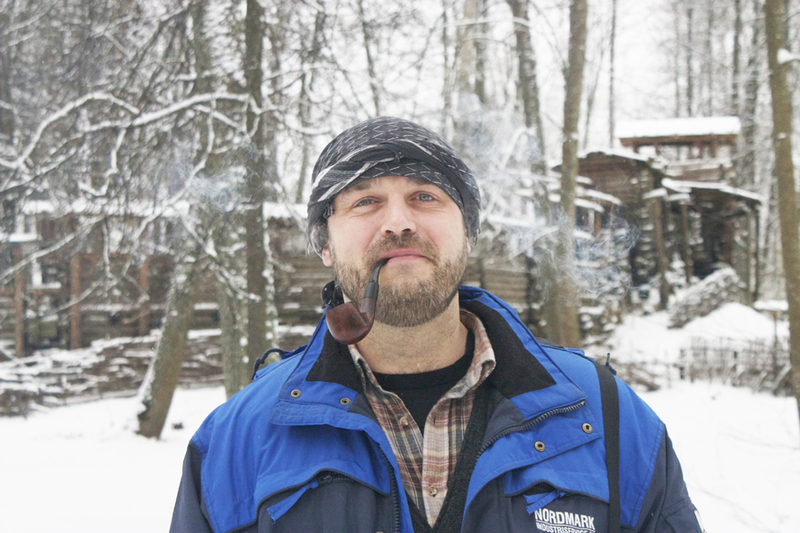 Our guide, R- a towering specimen of Latvian manliness at nearly 7 foot tall with old-fashioned manners and a wooden pipe. When we got to base camp we were greeted with hauntingly beautiful, melodic howling: a group of huskies smelt another pack of huskies nearby and were communicating with them the way their wild cousins - wolves - would. Despite the Siberian husky's physical resemblance to the wolf and their wilder instincts (they are much harder to train then most domestic dog breeds), the husky isn't actually the missing link between wolf and dog. In fact, all dog breeds are as closely related to wolves as the husky is! But humour me, let me believe that I'm dancing with wolves. The huskies were eager to run. Bred for hard work, with strong pack instinct and a real sense for pecking order (if you disrupt the order and put a husky in a different position than it is used to, all the dogs will get agitated and fight), Siberian huskies live for work. We were privileged to witness them as they should be; living in packs in large expanses of land where they could exercise their natural instinct to run, pull, and work as a team. It was clear that these huskies (unlike so many I've seen kept as fashionable pets in apartments and don't get the exercise they need to stay sane) were happy and keen to serve. 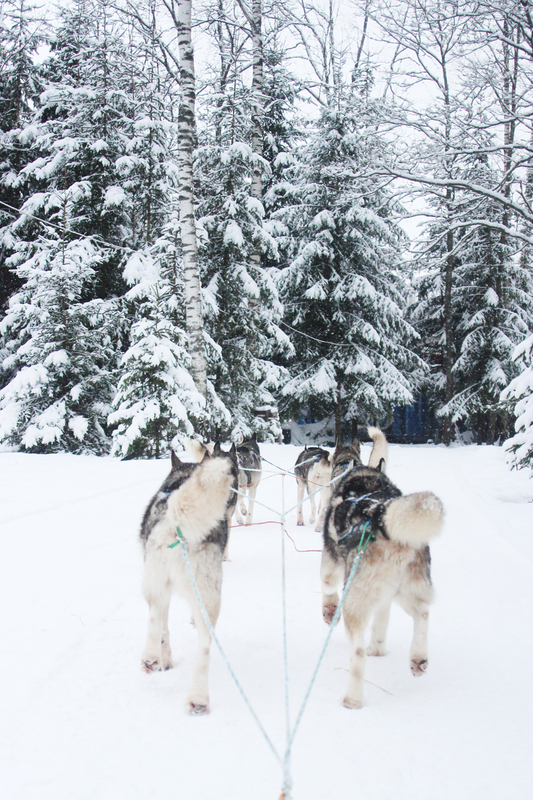 Our guide picked six dogs for our team, and one husky was so desperate to join that when she realised she was being left out she started crying like a fat child on a strict diet in a candy shop. Another team picked her, so it's all good! Henry and I went as a duo, without any help from a guide except for instructions on how to control the sled and direct the dogs. The huskies knew the route by heart anyway, so it was mostly up to Henry to keep us keep us on the sled during the five kilometre route. 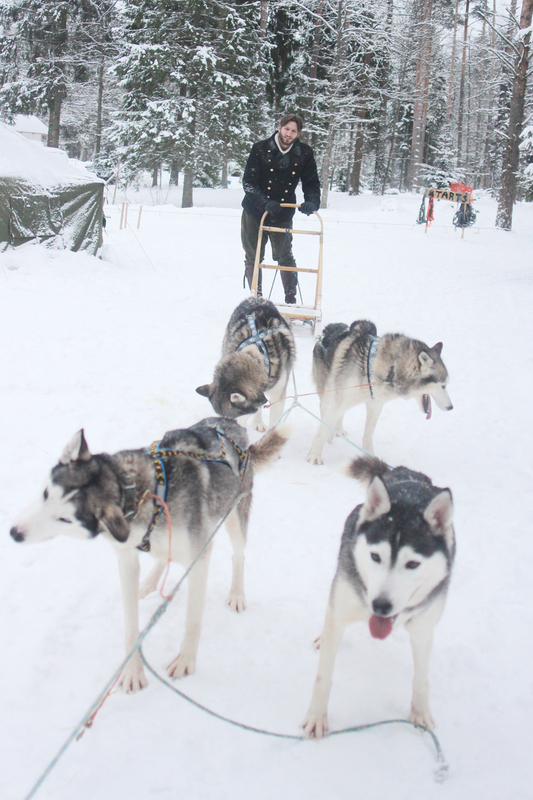 The dogs would run up to 50km/h through winding forest paths, leap across drops, dodge obstacles, and make sharp turns so balancing was quite tricky - at several points we were in real danger of tipping over especially whenever the dogs sped up to turn corners but Henry did an impeccable job of controlling the sled. I felt like the Snow Queen of Narnia in my fur coat, sitting prettily and yelling 'Mush! Mush! Run! Jump! Rest! Rest!' at the dogs who mostly ignored me and just did what they are trained to do. 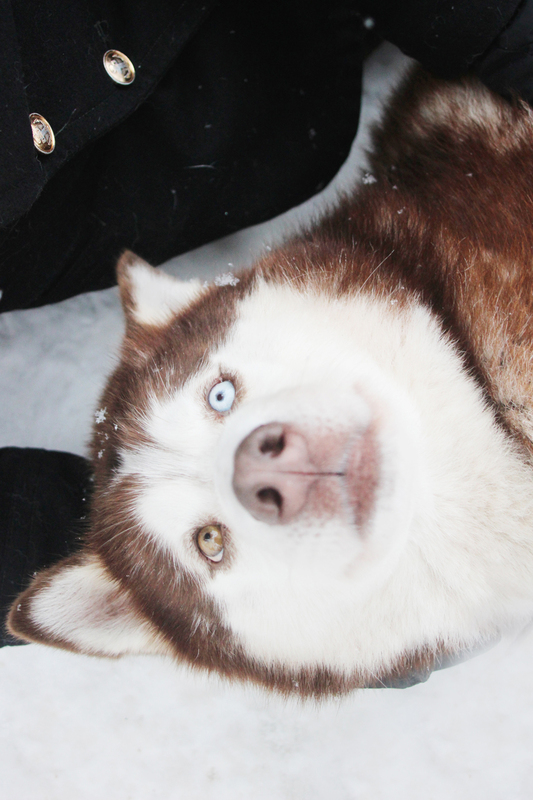 ...so wild, in fact, that the huskies mistook Henry as one of them and decided that he was the new alpha dog. I named this blue and brown eyed beauty Mischka. She was absolutely in love with Henry - whenever I approached him she'd stick out her leg and push me away with her paw: "He's mine!" Mischka looking on with jealousy as Henry turns his affections to another dog. Photo 1 courtesy of Tour Point. 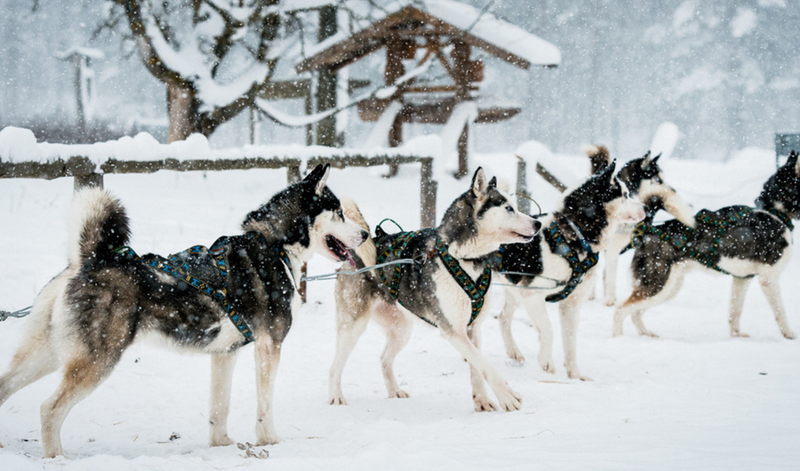 I thoroughly recommend an excursion with Tour Point - not just for husky dog sledding; they also do city tours around Riga, multi-day tours around Latvia, Estonia, and Lithuania, and offer customised tours just for you. Henry and I joined the husky dog sledding tour although it felt less like a tour and more like a trip with some friendly locals. 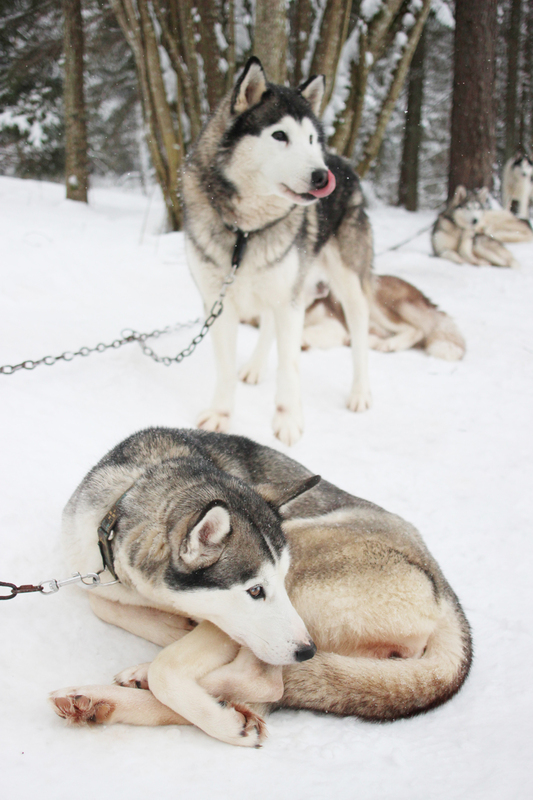 We were treated like friends - driven from the city to the countryside and had lovely banter all the way, fed mulled wine and delicious pastries, got to visit the other racing dogs, make friends with the huskies, and play in the snow, all for €95 each. Find out more on their website, here! Doggies! They look so cute. This definitely looks like a lot of fun, albeit a bit cold. This looks absolutley amazing. Your pictures and commentary really capture what a wonderful experience it must have been. Thanks for sharing! SO cute!! I love this post so much, I wanna cuddle a Husky! I knew this would be my favourite post. The dogs are so beautiful. Our Springer Spaniels were brought up as outside dogs. I can't imagine keeping a dog in an unnatural way that he's not used to. 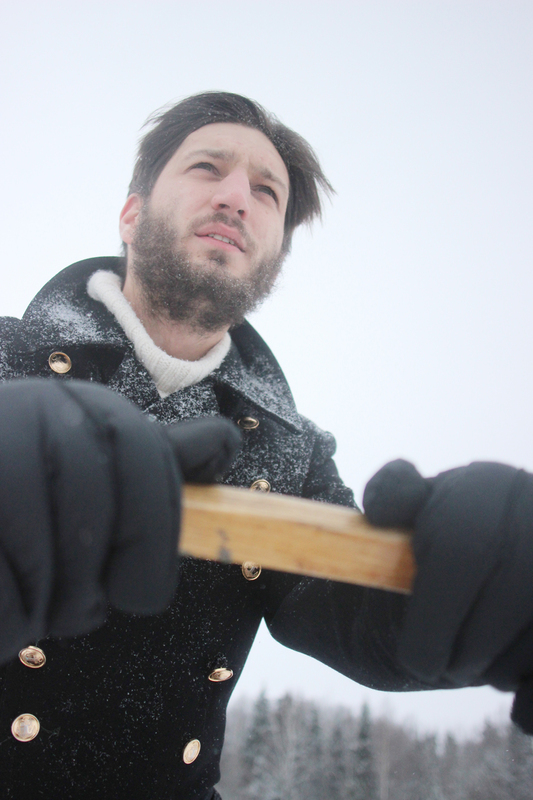 Your photos are amazing, I'd love to try real sledding. I've heard it's really difficult to stay upright! This post is making me melt. First of all you look amazing and the pictures are mint! But wow those dogs are stealing my heart. I am so jealous you went to Latvia, can't wait to discover the Northern Countries.